You'll be £4.99 closer to your next £10.00 credit when you purchase Blitzkrieg Russia. What's this? 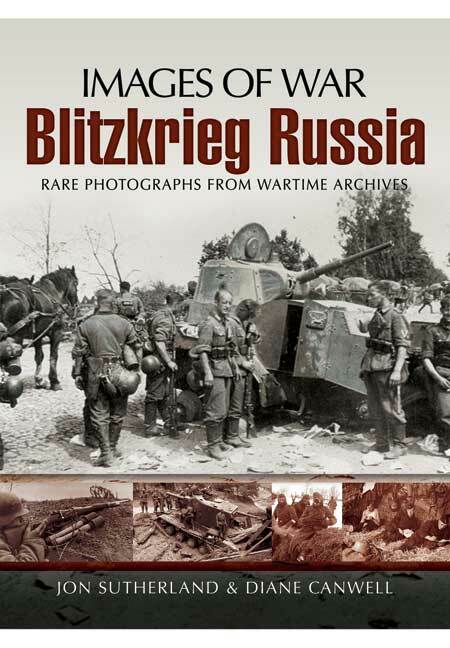 The photographs are taken from five unpublished albums focussing on the German invasion of Russia in 1941 – Operation Barbarossa. Two of the albums contain shots taken by German infantrymen and include shots of combat, vehicles, knocked-out tanks and prisoners of war. Two of the other albums feature flak and artillery units in the invasion. These include shots of artillery and flak units in action, destroyed Russian aircraft, vehicles and armour as well as Russian prisoners. The final album contains shots taken by a tank destroyer unit. In this set, there are shots of knocked out Russian armour (and abandoned armour), artillery and assault guns in action and a fascinating glimpse into the transition into the first winter. There are many exceptional photographs including rubber boats carrying troops across a river, knocked out monstrous Russian tanks, engineers at work and a range of more casual poses. There are also some interesting studies of uniforms and equipment, abandoned vehicles, vehicles being salvaged and maintained and a host of other subjects. Some are focussed on the early war months with Russia, so there are huge columns of captured Russian prisoners, fraternisation with the local peasants and a glimpse of the vast distances involved in the advances made by the Germans in the early months of the conflict. An interesting insight into the early stages of Operation Barbarossa, when the Germans very definitely had the upper hand.